Posts have been far and few between this summer. You are not missing much; I assure you. I have been battling strep throat since Memorial Day. I am on my fourth antibiotic. (See, I'm boring you already.) Also, much like the rest of the United States, Chicago has been broiling hot, so we've been spending a lot of time indoors. Fun. Jossie has been perfecting her walking and picking up new words daily. 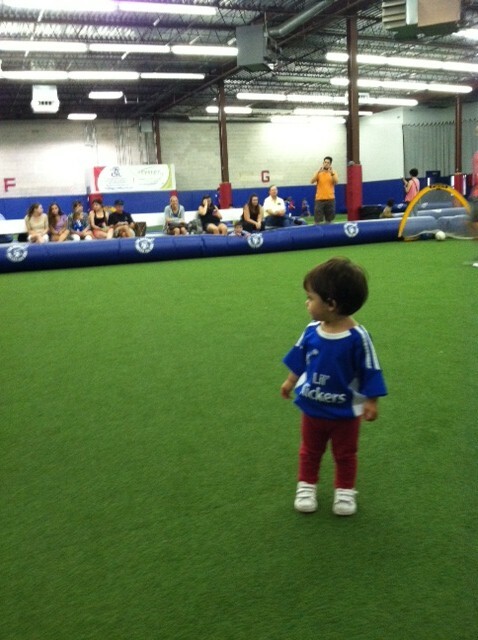 We took her and Jack to soccer class this weekend. One of her favorite words is "ball," so I thought she would love soccer. Turns out, she loves to play catch. Running around, listening to the "coach" and sitting quietly in a circle? Not so much. Granted, she was the very youngest in class. Her favorite activity was making routine beelines out of the class area. As we were running with the other children and parents in a "race," her feet barely skimming the ground as I pulled her along, she gave me a look like, "this is nuts, lady." As we did an "obstacle course," and I had her "jumping" over obstacles, a Cheerio flew off of her. I assumed today we'd do the same thing with our babies, but the coach instructed us to run in a circle, turning the parachute as the babies sat on it. I watched Jossie's reaction and was surprised to see she was okay. And then she wasn't okay. She frantically started to sign "All done!" and then burst into tears. I jumped in as soon as I could. She recovered and all was fine. Jack did a great job in his big boy class. 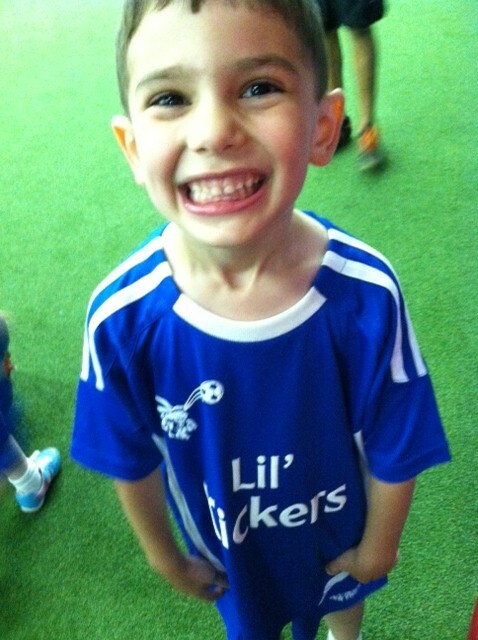 He still has my nonathletic genes in him, but he's getting more and more proficient in dribbling and passing the ball. I couldn't be more proud of him for just trying. 2028 Summer Olympic bound? Maybe, maybe not. But we're having fun. “I have two small children,” I answered in the affirmative. “Get some rest,” she advised. Perfect timing, as we were headed home to my parents. We spent last week surrounded by my family in Ohio – my parents and my two sisters and their husbands and kids. Jeremy drove us out, flew back to Chicago for work, and rejoined us Friday. It was a week of summer vacation, through and through. Bikes and chalk littered the driveway. Sandals of various sizes and colors were piled by the garage door. Nana was generous in doling out the Popsicles, and there was always a friend to play with. We came back Saturday night, and our condo seemed foreign to me. We had some work done to the walls and things were out of place. I spent much of Sunday pulling our place and things back together. By Sunday night, Jeremy and I had the condo back in shape and I declared it fajita night. I used a tequila lime marinade for the chicken, inspired by my friends who had served us something similar a few days beforehand. Combine the tequila, lime juice, orange juice, chili powder, jalapeno pepper, garlic, salt, and pepper in a large bowl. Add the chicken breasts. Refrigerate overnight. Heat a grill with coals and brush the rack with oil to prevent the chicken from sticking. Remove the chicken breasts from the marinade, sprinkle well with salt and pepper, and grill them skin-side down for about 5 minutes, until nicely browned. Turn the chicken and cook for another 10 minutes, until just cooked through. Remove from the grill to a plate. Cover tightly and allow to rest for 5 minutes. Serve hot or at room temperature. Sunday morning - we have a new bag of strong French roast coffee beans and I tried a new muffin recipe that Maria and Jack had found. These are cake-like muffins - perfection! Preheat an oven to 350°F. Grease 9 standard muffin cups with butter or butter-flavored nonstick cooking spray; fill the unused cups one-third full with water to prevent warping. To make the muffins, in the bowl of an electric mixer fitted with the flat beater, combine the butter and sugar and beat on medium speed until light and fluffy. Add the egg and beat well until pale and smooth. In another bowl, stir together the flour, baking powder, baking soda, salt and nutmeg. Add to the butter mixture in 2 additions, alternating with the buttermilk and vanilla. Stir just until evenly moistened. The batter will be slightly lumpy. Spoon the batter into the prepared muffin cups, filling each three-fourths full. To make the topping, in a small bowl, mix the brown sugar, cinnamon and melted butter and thoroughly blend together. Add in flour. Gently sprinkle topping evenly over batter in prepared muffin tin. Gently press down topping slightly. Bake until the muffins are golden, dry and springy to the touch and a toothpick inserted into the center of a muffin comes out clean, 20 to 25 minutes. Transfer the pan to a wire rack and let cool for 5 minutes. Unmold the muffins and let stand until cool enough to handle.